I have suffered from eczema since the age of two. At the age of 24 the condition became much worse. My skin was inflamed, red, extremely dry and itchy. My sleep was being affected and the emotional, mental and physical toll was exhausting. 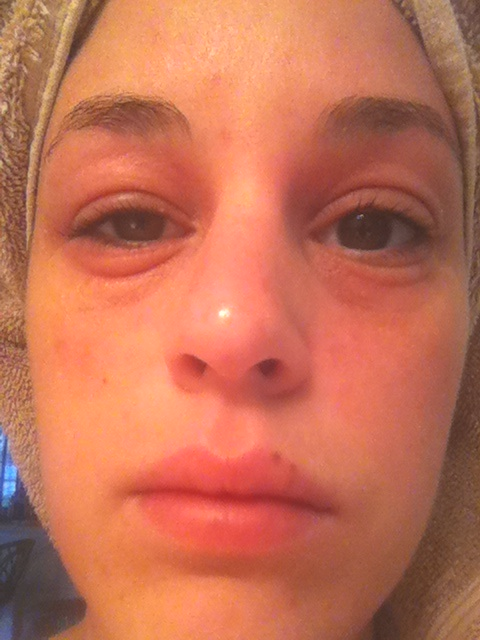 I was seen by various dermatologists, doctors, allergist and internal specialist. No one could find a solution to the problem and I was unable to find relief. The day I met George he immediately asked me about my skin. I was unaware of George's profession at the time. I told him I had an appointment the next day with an internal medicine doctor. He assured me that if I completed the therapy with him that night , that I could cancel my doc apt. Before the two hour session my skin was horrendous. The emotional and physical healing that took place during our session was unbelievably beneficial. My skin looked ten times better within the first hour. At the end of the session I felt light as a feather and my skin looked a million times better. Since then I have not had the extreme symptoms of eczema. I remind myself of our therapy weekly and practice meditation for natural healing. George just may be the most amazing human being I’ve ever met. I came to find George because I heard his massages were fantastic- which they are. However, his emotional and spiritual healing techniques are pure magic and changed my life. He surfaced emotional issues buried deep that manifested into physical symptoms. Once released, wonderful things happened for me. I am now a published author with my book on Amazon, doing well in my career, and most important have more peace in my life. My only regret is that I live out of state and cannot see George more often! I have spinal stenosis and several other ailments due to an accident at the age of 12. Over the years, I have had several surgeries to correct some of the problems but I'm not a candidate for back surgery. I have seen many doctors trying to get some pain relief for my back but nothing worked except drugs that really made me unable to function. I had just about given up all hope when I found George. In one hour he relieved the back pain and taught me how to keep it that way. George also explained that unreleased emotions and fear can cause pain problems that keep recurring even after structural release work. Over a few sessions we found these fears and emotional baggage that was at the root of a lot of the pains I had. George helped me work through these issues. What George has given me is my life back. It is a God-given gift that he shares with those willing to try. Life is full of ups and downs; George makes the downs into ups. George is a one of a kind master healer. I was introduced to George nearly 5 years ago to help with basil thumb arthritis that my doctor said required surgery as I had exhausted the number and effect of numerous cortisone injections. George using holistic Kinesiology effectively reduced my pain and five years later, I am not in any need for surgery and my arthritis is all but unnoticeable. As a regular client of George’s I frequently seek his help in identifying and resolving physical manifestations of muscle imbalance. Only a few weeks ago, I asked George to help me with a problem in making an athletic golf swing. The problem was I was not turning my body around my spine but rather sliding through the shot. George, through a series of interpretative Kinesiological methods identified a muscle imbalance where one muscle was effectively bullying another muscle. George applied his knowledge and skill to weaken the bully muscle and strengthen the energy lines of the weaker muscle. Since then my golf game improved about 5 shots as my ability to complete the swing properly was restored. I highly recommend George as I have seen and experienced many of his healings over the years and thoroughly trust his ability to find and remedy virtually any imbalance. Working with George and placing your trust in him has proven very effective for me. I had been suffering intermittently with lower back pain. George was recommended to me through our fitness club. After spending just 90 minutes with George, my back pain was gone. It has now been 3 months and there is literally no pain or even discomfort in my back and I play golf at least three times per week. While George's techniques may seem odd to some, I stand as living proof of his effectiveness. After recovering from surgery on a fractured femur on my right side, I began to experience severe pain in my left leg. I went to an orthopedic surgeon, family doctor, an acupuncturist, and a massage therapist. None of whom could help me and were unable to tell me the source of my pain. I was unable to do the things I needed and wanted to do, and resorted to using a cane. While visiting my daughter in Naples, she suggested that I see George Zimonyi. I was skeptical, but desperate. After one treatment, I was free of pain and my cane. On my gratitude list, George P. Zimonyi is at the top of the list. I've had MS for 27 years and I now walk with the assistance of a cane because of my unstability. I recently met a patient of George Zimonyi who suggested that he might be able to help my situation. Due to his knowledge of MS and confidence that he would be able to help me, I made an appointment a few days later. My husband and I went to doctors and naturalists who claimed to be able to help but left those appointments disappointed. Our luck was about to change. Mr. Zimonyi was very professional, and his healing techniques were like nothing I had experienced before – his energy work released many of my fears and in turn energized and calmed my entire being. After my 2 hour session I was amazed to leave his office without the assistance of a cane feeling mentally and physically energized. George is a very spiritual person, his gentleness made me feel very comfortable and his healing methods are wonderful. Thank you George. George is cutting edge healing at its best "I'm a nurse and a Healing Touch Practitioner and self care is of the upmost importance. I have a solid regimen but I continued to struggle with a history of all over body pain. I have experienced George's techniques twice now and each time were amazing. He is a master at following the energy and learning your energtic patterns and blocks. He gets to the real core, the core that I have not yet met anyone able to release. He nourishes the difficult emotional blocks/traumas within the body and releases and clears them. The first session he found every area or misalignment in my spine needing attention/healing and gently and patiently used his unique healing gifts to release/clear them. I experienced much improvement in my lower back/right leg pain. The second session we focused on pain in my midback and we released a blocked pattern. Two days after the session I experienced major clarity and breakthrough for my personal practice of Healing Touch. I can feel energy shift and I felt it during each session and if you are aware and mindful with everything you do, you will be amazed at what George can shift for you energetically thus showing up in your physical life. George is cutting edge healing at its best that makes sense; a high vibrational healing frequency. Thank you for your unique gifts for healing George!" "I broke my ankle four years ago. I had pain every day until I saw Practitioner George. After one session, he got to the root of the problem. To this day I am pain-free. ​"After having moved from NY I thought to myself 'I can now experience the joy I'm feeling all around me in Naples'. That feeling did not last long. Slowly I started to feel unhappy & could not figure out why. Then I met George. My husband first saw him for leg pain & he told me about George's healing methods. I was intrigued. Although I had no physical ailment, he helped me unblock the emotional pain I felt inside. It was a very powerful healing experience. I walked in heavy hearted & sad, and walked out lighter & at peace. George truly has an amazing gift, his genuine care and authenticity shine through his encouraging words and hands. I believe he is one of those Angel on Earth here to help people heal and reach their true God given potential"
George, thank you for making time for me! One hour with you does more for my well-being than six months with a psychiatrist! There's a special place called THERE in the human spirit, mind, and body. George works with your own natural healing process to take you there, restoring your peace and balance, leaving you fully connected and restored. George is an incredible practitioner on so many levels. As a Somatic Release Therapist, George is extremely talented his ability to release muscle tightness without pain is wonderful. His use of different energy modalities allows him to clear not only muscle imbalances but energetic imbalances as well. He has been able to assist me in overcoming both old and new negative subconscious tapes. I always feel wonderful after a session no matter which type! His patience, understanding and ability to connect energetically with his clients makes him a unique find and a great practitioner. I had my first therapy with George last weekend and it was truly amazing. Years of Chiropractic adjustment, pain medications, painful massages to try to ease discomfort in my neck and shoulders. George worked his magic and it was truly transformative. I am so grateful and from now on will seek healing from George and his gifted hands.
" I was recovering from back surgery and had been in a body brace for six months. I could not stand up straight and had to curl my toes in order to keep my balance. The extreme pain and anxiety had also broken my spirit. My career as a business executive was on hold. Then I made an appointment with Kinesiology Practitioner George Zimonyi. With his knowledge and healing expertise, George made it possible for me to get my life back. He healed my body and my spirit. I am back in the board room, and despite what the doctors said, I am wearing high heels again! Thank you George!" "Ok. So I was told I need surgery. Bulging disc, tear... Bla bla bla. I finally listened to some of my crazy friends and went back to the amazing George Zimonyi. I had days that I couldn't even walk. Emotional distress is the worst. I'm always happy so I didn't realize what my body was taking on for my lack of owning real world problems. Today I am pain free. 100%. Blessed. Thank you George."